This article is about Galaxy Arena court in general. 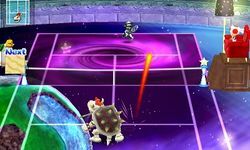 For the battle tournament stage from Mario Kart Wii known as "Galaxy Arena" in PAL regions, see Galaxy Colosseum. 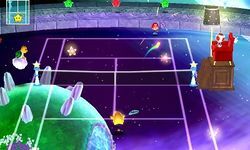 Galaxy Arena is a galaxy-based court in Mario Tennis Open. It has objects from Super Mario Galaxy, such as Shrinking Tiles, a Launch Star, Star Bits, a planet from the Gateway Galaxy, a black hole, Turquoise, Red and Green Lumas, and the whole Comet Observatory in the distance. The special game Galaxy Rally is played on this court, where the Star Chips appear on the court, and the player may try to collect them by hitting the tennis ball at them to receive coins. It is an unlockable stage, and it can be unlocked by completing the Final Cup in the Star Open Tournament. The unlockable stage has differences from the one played in Galaxy Rally; it lacks the Shrinking Tiles and it takes place in an another location. Also, it has two varieties: the Crystal court, which provides max speed and max bounce for the ball but cannot be played on in Tournament mode, and the Morph court, that uses various surfaces from other courts in the game affecting ball speed and bounce. When the player performs a chance shot, and the ball hits the ground, the surface on the opponent's side of the court changes and their own surface returns to normal. A unique surface with a black hole pattern erratically makes the ball bounce into one extreme direction. While this surface is used in all rounds of the Final Cup, different sets of three other surfaces are used in each round. The starting round uses the hard, mushroom, and stone surfaces. The clay, ice, and wood surfaces are used in the semifinals, and the final round uses the grass, carpet, and sand surfaces. Ring Shot is not playable in this court. This page was last edited on February 27, 2019, at 18:13.